Thank you to all the volunteers who found time to work on the Toronto Trust Cemeteries indexing project in 2012. Every name indexed is appreciated and it has been gratifying to see part of our efforts available for researchers. In fact, a few grateful researchers are now volunteers on the project. A special thank you to Barry, Joyce, Verna, Heather, Marg, and Valerie who have each indexed and/or arbitrated over 5,000 records. Quite a contribution to family history accessibility, considering that each record contains at least two names and frequently three or more. In 2012, we indexed 68,838 records and arbitrated 24,590. Our numbers are down a bit from 2011 (when we indexed a spectacular 81,000 records) but still well above the figures from previous years. We are getting so close to the end! Let me see if I can quantify just how close. By my calculations, we have indexed roughly 229,000 records since the project started on September 30, 2009. That number includes both indexers, so the real number is about 114,500 records*. The folks at FamilySearch tell me that we have indexed about 90% of the images or batches, or about 4,260 of the 4,747 images in total. Now if we divide 114,500 records by 4,260 we have an average of about 27 records per page. But the batches we’re working on now have considerably more than 27 records—closer to double that—so while that means we’re not at 90% of the records, we’re sure getting close! Please make indexing one of your new year’s resolutions! Even a page or two will help push us towards the finish line in 2013. If you’d like to help, contact us at fsi@torontofamilyhistory.org. *In FamilySearch indexing, every record is indexed by two volunteers independently. 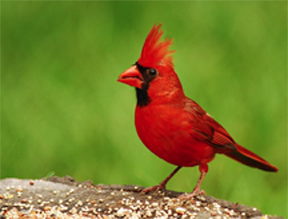 An arbitrator resolves any discrepancies between the two interpretations. Just where was James Crawford born? As family historians we know that we should look at multiple sources for every fact we add to our tree. Three sources is a good rule of thumb, but “a reasonably exhaustive search” is required by the Genealogical Proof Standard. A place of birth in the Toronto Necropolis burial register that puzzled volunteer indexer Marg Kelliher is a great example of why multiple sources are very necessary. Huh? We were still mystified. The gravestones in the Necropolis were transcribed by OGS Toronto Branch and published in 2002. The transcription shows that James, his wife Margaret Henderson and six family members are commemorated on markers on plot L 147. James Crawford’s place of birth is carved in stone as: Enniskillen, Ireland. 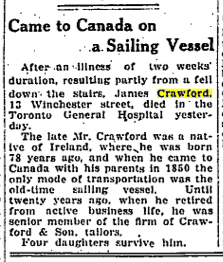 Obituary for James Crawford of Toronto, in The Globe, July 8, 1919. But is that what the burial register and death register were trying to say? Were those records providing more specific—or perhaps conflicting—information? An obituary in The Globe on Tuesday, July 8, 1919, provides more clues to follow up but no resolution to the place of birth question. If you can decipher (or even hazard a guess) about either bit of handwriting—or if you can add to the story of Mr. Crawford—we’d love to hear from you. 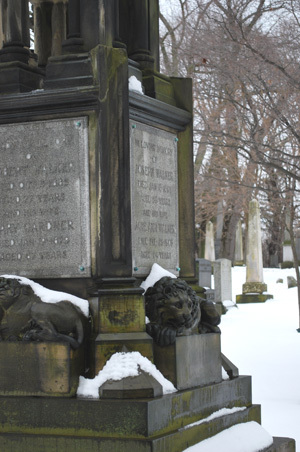 Would you like to join the crew of indexers working on the registers of Toronto cemeteries? Read more about the project here. You can find the page of the Necropolis register where James Crawford appears here. While transcribing the burial records for the Necropolis Cemetery, I came across an entry that intrigued me. The person buried was “Baroness Olga Heimrod”. She died 23 September 1912 of apoplexy. It’s not everyday that a Baroness dies in Toronto. A little curiosity led me to find out more about the Baroness and her husband Baron Ernest von Heimrod. From a search of Ancestry.ca, I was able to find census records from 1881 and 1901 as well as registrations of both of their deaths. These records show that Olga was born on 3 Oct 1839 in Germany (Prussia—according to the tombstone inscription). Her father is listed as Enrich Crome and her mother is listed as Johanne K.E.D. Schiche. Olga’s husband is listed as Ernest and he was born 26 Feb 1833 in Germany. In Germany, Ernest’s name was Ernst. With just a little digging, I found that he was part of the Hesse-Kassell noble family. According to these documents, his full name was Ernst Baron von Heimrod. His lineage can be found on The Peerage website. Ernest was the illegitimate great-grandson of William I, Elector of Hesse (German: Wilhelm I., Kurfürst von Hessen; 3 June 1743 – 27 February 1821). William I was the eldest surviving son of Frederick II, Landgrave of Hesse-Kassel (or Hesse-Cassel) and Princess Mary of Great Britain, the daughter of George II. On the Peerage website, Olga’s maiden name is listed as Cornel. Unfortunately, I could not find any additional information about Olga’s heritage with either of the surnames. According to the 1901 census, both Olga and Ernest immigrated in 1871. Was there significance to their immigration coming in the year of the formation of Germany under Bismark? There is some general information about German immigration in A History of German Emigration to Canada, 1850 – 1939 by Jonathan Wagner, but nothing specific. Obituary for Baron Ernest von Heimrod, Toronto Star, June 20, 1910, front page. In 1881, Olga and Ernest were living in East Toronto in the St. Thomas Ward and Ernest’s profession is listed as “restaurateur”. In 1883, according to the Register of Dominion Annual Register and Review, Ernest was appointed “Consul for the German Empire for Ontario with the exception of the Counties under the Jurisdiction of the Consulate at Montreal”. Ernest held this position until 1888. In his obituary in the Toronto Star (June 20, 1910), it is mentioned that Ernest was quite wealthy when he immigrated to Toronto but lost almost everything in a real estate crash in 1888. At one time he owned property near the Humber River that was sold for $40,000—quite a sum for the times. In 1901, Olga and Ernest were living in the Toronto Junction area (now part of Toronto) on a small piece of land that they retained. Ernest’s occupation is listed as an “agent”. According Might’s Greater Toronto City Directory of 1903, Ernest was living at 134 Cawthra Avenue and his occupation is also listed as an agent. Given all the train activity in the area, I would guess that Ernest’s job had something to do with that. Information about The Junction can be found at The West Toronto Junction Historical Society. In 1910, Ernest passed away on June 18 from Bright’s Disease which he suffered from for several years. His full name was listed as Ernest Freiherr Heimrod. Two years later, Olga died. At the time of her death, she was living in the Aged Women’s Home. There is a listing for Aged Women’s Home at 47 Belmont Street in the 1912 City of Toronto Directory (This is a precursor to the present-day Belmont House). The Aged Women’s Home was set up to prevent elderly women from being homeless so it appears that Olga’s fortunes continued to decline after Ernest’s death. Ernest and Olga do not appear to have had any surviving children. In her will (written 24 October 1911, and probated 22 November 1912), Olga named the German Society of Toronto as executor. The Society renounced administration to the Trusts & Guarantee Co. Olga left her total estate, $417.50 cash and $50 in “household goods and furniture”, to the four children of her “late sister Elise Marie Crome, widow of the late Dr. Eltze, of the City of Charlottenburg, in the Kingdom of Prussia”. 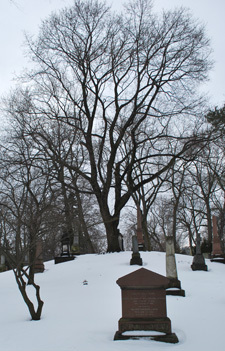 The German Society of Toronto or “Deutsche Geselleschaff” was named as the owner of Olga’s grave in the Necropolis burial record. The “Deutsche Geselleschaff” was a benevolence society for Germans living in Canada that ensured that members received an honourable burial. The modest flat grave marker for Olga and Ernest (Section A, Range 1, Plot 17) adds that the Baron was born in Anhalt-Dessau, and that “Olga Crome Baroness Von Heimrod” was born in Prussia. Toronto Necropolis and Crematorium. Toronto: Ontario Genealogical Society, Toronto Branch, 2002, pp 9–10. Janice Nelson, who lives in Calgary, is a member of the Alberta Family History Society and a volunteer indexer for the Toronto Trust Cemeteries Project. If you can add to the story of the Baroness, or if you would like join the indexing project, please contact us at: fsi@torontofamilyhistory.org. In the last couple of weeks, indexing volunteers working on the records of the Toronto Necropolis have come across the re-burial in 1911 of remains from a nearly forgotten downtown Toronto cemetery. The small cemetery was located on the north side of Duchess Street (now called Richmond Street East) roughly bounded on the east by Stonecutter’s Lane, and on the north by Britain Street. The west boundary was a third of the way to George Street, at about today’s 260 Richmond Street East. It was about a half acre in size. The boundaries of the graveyard were reportedly somewhat undefined as bodies were unearthed when both Caroline (now Sherbourne) and Britain streets were built. The property lay directly south of William Allan’s 100-acre Park Lot 5. The Park Lot started at Queen Street and ran north all the way to Bloor Street. Allan also owned an extension of his Park Lot south of Queen Street known as the “meadow” which included the lot on Sherbourne east of Stonecutter’s Lane. The meadow had a stream running through it. The angled path of today’s Britain Street echoes the path of the stream, and seems to be the dividing line between the burial ground and Allan’s meadow. You can read more about William Allan and his family in our Simcoe’s Gentry project. The 1834 directory of the Town of York tells us that the cemetery belonged to “the Presbyterian Church in Hospital-street, Rev. Mr. Harris, Minister”. (Hospital Street is now part of Richmond Street.) Rev. James Harris was the son-in-law of prominent Torontonian Jesse Ketchum who donated land at Yonge and Richmond streets in 1821 to build a church for the Presbyterian congregation of York. Harris was the first minister, staying until about 1844. The church was named Knox in July 1844 after the Disruption within the Church of Scotland. But the Duchess Street burial ground dates back to long before 1834—and was not always Presbyterian. A petition to the Executive Council of Upper Canada in 1824 from three trustees, Colin Drummond, Jesse Ketchum, and John Ross, representing the Presbyterian Congregation of York sheds considerable light on the subject. 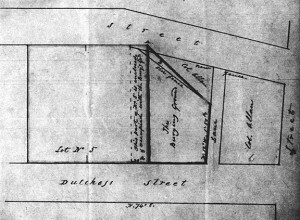 On September 14, 1824, the trustees requested that the “Gore between Lots Number Four and Five on the North side of Duchess Street containing about half an acre of land” be granted to them. They stated that the land had been used as a burying ground “upwards of twenty years” and that the Presbyterians had been burying their dead there for the latter part of that period. The trustees had investigated and found out that the property was not owned by anyone and therefore grantable. They wished to enclose and secure it and continue to use it as a burying ground. So the burial ground on Duchess Street dates back at least 214 years, and perhaps a little longer! A second document supporting the 1824 petition states that York’s Anglican minister acknowledged that the Duchess Street burial ground had earlier been used for “general interments” but was “by common assent of the Inhabitants allotted to the Presbyterian Church”. 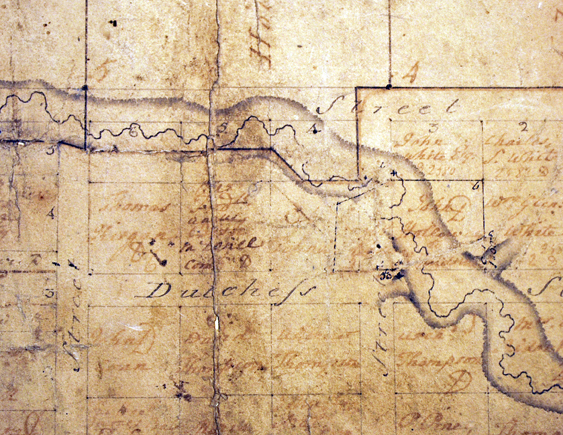 An Order in Council on December 1, 1824, granted the land to the Presbyterians, and the transfer was completed in March 1825 when the survey fees were paid. The adjacent Lot 5 on Duchess Street was sold by Alexander Macdonell to William Jarvis in 1807 and recorded June 26, 1817. A copy of the legal description and a sketch of the property are pasted into the Knox Church minute book and dated March 3, 1849. The documents show that the burial ground had mistakenly enclosed a strip of Lot 5 within the fence. This strip of land came into question again in 1858 and 1859, when a grandson of William Jarvis, George Murray Jarvis, tried to reclaim the 26-foot-wide strip and sell it to the trustees. Legal opinions recorded in Knox’s minutes said that George Jarvis was out of luck. The fence had been up and the burial ground used without objection for much too long, and the most recent date on a tombstone, within the strip in question, was 1841. An 1868 article in the Globe, describes the burial ground as “a romantic little nook” with “about a dozen moss-grown stones”. “A solitary cow crops the grass which covers the still visible mounds”. It claims that no burials had taken place for 20 years and many bodies had been moved to other cemeteries. Apparently the map of the cemetery had “got all into confusion” so that families who wished to move loved ones could no longer do so. A 1904 article in Landmarks of Toronto, claims that the burial ground was used until the establishment of the Necropolis in 1850, but the Globe article mentioned previously would indicate that burials in the later period were likely few and far between. The 1904 article states that the grave markers were buried, the ground leveled, and from the mid 1830s, part of the land used for a carpenter’s shop and cottages. In about 1886, the Duchess Street Presbyterian Mission Chapel (associated with Knox Church) was built on the property, and according to Landmarks, when a cavity was dug to accommodate a furnace, a quantity of human bones were found and carefully reburied. In mid-March 1911, articles from the Toronto Star give us a graphic report of gravestones and 19 bodies found during excavations around the “old Duchess Street Mission”. One large gravestone unearthed apparently bore the inscription: “Sacred to the memory of Eggleson McDonald who misfortunately was drowned July 12, 1835, age 24.” The articles also describe the nearly indecipherable coffin plates that were mainly painted rather than engraved. Only one name from a coffin plate, “Powell”, is mentioned, with the date “May 1, 1828.” The reporter notes that a stone used as a step into the Mission building was “sacred to the memory of someone whose first name was Duncan”. He also notes that all the bones were to be reburied at the Necropolis. The Toronto Necropolis register shows “59 remains removed from the Duchess St. Presbyterian Church Burying Ground” reburied on April 6, 1911, in Plot L 106. The plot owner is the “Moderator Knox Church Sessions”. There are also two re-interments with names: Anne Drummond Kennedy, age 10 who died 12 March 1834, and Duncan Kennedy, age 45 who died 31 March 1834. An entry on July 21, 1911, shows the burial of another “19 unknown remains from Duchess St. Presbyterian Cemetery” in plot L 106. On December 21, 1911, another 75 remains were buried; on June 5, 1912, 64 remains; and a single burial on October 25, 1912—all in the same plot. The removal of remains from the Duchess Street burial ground was apparently done to allow the sale of the property. Our Places of Worship Committee’s files show that part of the proceeds of the sale in April 1911 was distributed among four churches—Dufferin Street, Riverdale, Rhodes, and South Side. Unfortunately, no burial register for the Duchess Street Presbyterian Burial Ground seems to have survived. A fire that destroyed Knox Church in 1847 may explain this, but the map described in the 1868 Globe article mentioned above makes me wonder if the records were saved from the fire. The records of baptisms and marriages from Knox begin in 1823 and have been transcribed by Toronto Branch. They were originally buried in the Presbyterian Burying Ground at Duchess (Richmond) and Caroline (Sherbourne) Streets, between 1818 and 1841. Due to steady expansion of the city, the cemetery was closed, and the remains of 263 persons were removed to this location in 1911 and 1912. Although few of those buried here are identified, family records indicate that several members of William Lyon Mackenzie’s family, including three of his children, are interred in this lot. Requiescat in pace. As we continue to index the Necropolis burial registers, we’ll watch for more of the burials from the Duchess Street graveyard. If you can shed more light on this bit of Toronto’s history, please get in touch. 1. York Commercial Directory, street guide, and register, 1833–4. page 9. 2. Robertson, John Ross. Landmarks of Toronto… 1834 to 1893. J. Ross Robertson: Toronto, 1894, pages 510 and 511. 8. ibid. pages 9, 13, 16–18, 20, August 14, 1858 to March 16, 1859. 9. “The Cemeteries” article in the Globe, 21 Nov 1868, page 1, col 8-9. 10. Robertson, John Ross. Landmarks of Toronto… 1834 to 1904. J. Ross Robertson: Toronto, 1904, pages 223 and 224. 12. Toronto Star, 14 March 1911, page 1, col 8 and 15 March 1911, page 7, col 7-8. 14. Necropolis Register for 1911, entry 31546. 15. Necropolis Register for 1912, entry 31817. 16. Necropolis Register for 1912, entry 31888. 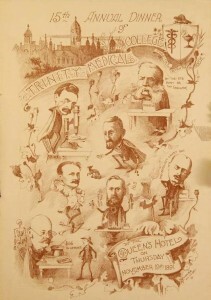 Menu cover for the 1891 annual dinner of Trinity Medical College. The College was on Spruce Street, just a few blocks from the Toronto Necropolis. What took this young Ontario doctor to Montana? What was the Toronto connection that brought him all the way back to the Necropolis—in what seems like a remarkably short nine days? And of course, his death by accidental poisoning was really intriguing! However, I did have at hand a transcription of the gravemarkers in the Toronto Necropolis published by OGS Toronto Branch in 2002. In plot N 64, the marker commemorates Henry Head Gray M.D., 1865–1891, as well as his father John Gray (1823–1872), mother Jane Head (1826–1904), a young Robert L. Gray (1861–1869), and Rebecca Gray (1821–1869). Armed with this cluster of names, dates, locations and John’s occupation, I was able to locate the family in census records, through Ancestry.ca. In 1861, 37-year-old John was a “brewer” in Dundas, Ontario, but by 1871 the family had moved to Yorkville (now part of Toronto) and John was a “merchant”. Our Dr. Henry Gray seems to be the youngest of at least six children, with older siblings Caroline M. (born c1853), John H. (c1855), Eliza R. (c1857), Anna (c1859), and Jane (c1863). By 1881, a widowed Jane Gray can be found living with her six adult and teen children, the youngest Henry at 16. Older brother John H., age 25, was now a merchant, perhaps looking after the family business. By 1891, a 65-year-old Jane Gray is still living with three of her daughters: Caroline is a public school teacher, and intriguingly, Eliza and Jane are both medical students. Our Henry, of course, has gone to Montana, died, and been brought back to Toronto for burial just about two weeks before the census. Or was he? City directories for Toronto fill in more details. These are available online as part of the Toronto Public Library’s digital collections. John Gray’s business was Gray Brothers, located on the west side of Yonge Street in Yorkville in 1870. In 1889, before Henry set off for Montana, the family lived at 259 Wellesley Street (at Rose Avenue). Eliza was a teacher at Park School, and Jane “Miss Jennie” taught at Bolton Street School. Our young “Harry” was a student. What took the newly minted doctor, Henry Head Gray, to Hamilton, Montana? The Montana Territory had only just become a state in 1889, and Hamilton was even younger, established in 1890 by copper mine owner Marcus Daly as a company town for his lumber mill. Did Daly advertise for a doctor for his workers? Certainly Montana was very much in the news in Toronto. 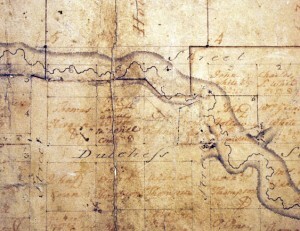 In the months before Henry’s departure, the Globe carried reports of new railway lines into Montana from western Canada. There were ads for special flat-fare excursions from Chicago on the “Atchison, Topeka & Santa Fe” which included Montana on the list of exciting western states and territories. And Toronto’s Exhibition of 1890 was to include a Wild West Show with “fiery mustangs from Montana”. But the “curious” part of this story is not why and how Henry died in Montana in 1891. The mystery is whether he died in 1891. Henry Head Gray, MD. Trinity Medical College, Toronto, 1890; of Oklahoma City; was found dead in his room in the Blossom House, Kansas City, March 10, from the effects of poison, self administered, it is believed, with suicidal intent, aged 46. (Journal of the American Medical Association, March 28, 1914, page 1032. This Henry Head Gray died almost 23 years later than our Henry, but also in March. The age 46 in the obit puts his birth year at about 1868, within two or three years of the 1865 recorded on our Henry’s gravestone. Did someone take the diploma from the wall of Henry’s office in Hamilton when his body was shipped back to Toronto and assume his identity? Did the real Henry live on—out of contact with his Toronto family? In that case, who is really buried in plot N 64? Or is it all just a remarkable coincidence? Last weekend, I came across an interesting fellow in the records of the Toronto Necropolis. Let’s just call him “John” for now. The Necropolis register showed John, aged 39, drowned on April 24, 1855, and was buried the next day. He was born in England. The plot was owned by Jane, presumably John’s wife. John’s surname was Treiblecock. Unusual, and as you can see in the image below, someone had taken pains to see that it was corrected from an earlier version. Indexers working on both the York General Burying Ground and the Necropolis have seen many other variants of the surname—even as two words. Coroner Duggan held an inquest yesterday forenoon on the body of a man named John Trebilcock, who was drowned a few hours previously in the river Don. It appears that a little girl fell into the stream and was being carried away by the current when the deceased ran to rescue her but his feet slipped off a log and he fell in and drowned. The child was saved by a person residing near the place. The deceased kept tavern for some time not far from the scene of the melancholy occurrence. 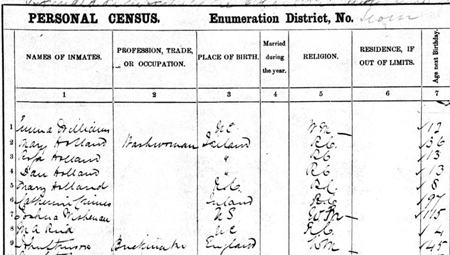 The census taken in January of 1852 shows John Treblecock, innkeeper, age 36, with his 23-year-old wife Jane, and children M-Jane (age 4), Elizabeth (2) and Joseph (1). John ran the tavern in a 2-storey brick house. (York Township, east of Yonge Street, District 42, Subdistrict 402, Division 2, pages 324 and 325). So who made sure John’s name was recorded as “Treiblecock” in the Necropolis register? Was it his young widow with three small children trying to stay in control of one small aspect of her suddenly chaotic life? By the 1861 census, widow Jane Treiblecock had married David Mathers, tavern keeper, of Todmorden and two more children had been added to the household. 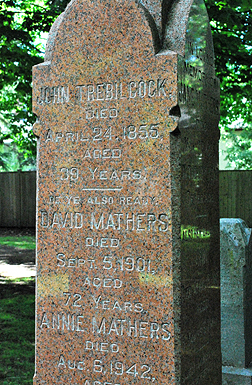 John Treiblecock is commemorated on the red granite Mathers obelisk (Lot D 201S) opposite the main gate of the Toronto Necropolis. The monument is much more recent than 1855—and unfortunately (in my opinion) records John’s surname as Trebilcock. Toronto Necropolis register image is part of an ongoing FamilySearch Indexing project to index the records of the Toronto Trust Cemeteries. When the index is complete, researchers will have access to these digital images so they can consider the “original scribble.” Indexing is done online. You can help. Spring! And a family historian’s mind turns to… cemeteries. The Victoria Day long-weekend is the traditional time for Ontarians to open their summer cottages, dust off the patio furniture—and for genealogists—to think about transcribing cemeteries. Members of the Ontario Genealogical Society’s Toronto Branch have been very busy this winter and spring preparing to host close to 800 guests at the largest genealogical gathering in Canada, OGS Conference 2010. Forty-five of our “guests” had a look at the Toronto Necropolis as part of the “Toronto’s Irish Heritage” bus tour. But the conference is all done now! 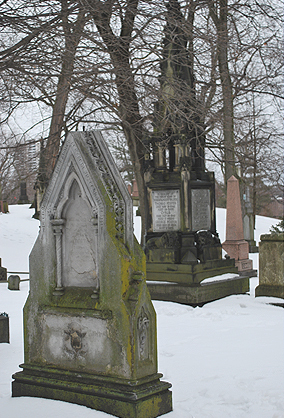 This Sunday, May 23, at 2:00 pm, you can join historian Mike Filey for a tour of the west side of Mount Pleasant Cemetery. Meet just inside the Yonge Street entrance. Expect a very large crowd! Here’s a map. While we resist the urge to research most of the names we transcribe—old Joshua deserved a second look. My first thought was a death notice in the newspaper. Surely dying at 116 deserved a note in the Globe. But although the digitized pages for the end of year 1861 were difficult to read, I didn’t find a notice for Joshua Wilson. Joshua died on December 28, 1861, so I next consulted our Toronto Branch expert on the 1861 census, Pat Jeffs. Using a combination of her annotated transcription, and the images at Ancestry.com, Pat located a Joshua with a difficult-to-decipher surname that she had transcribed as “Wisbenon”. The name certainly didn’t look like Wilson, but this Joshua lived in Yorkville and was listed as 115 years old. He was also born in the United States, which matched our Necropolis entry, and was Wesleyan Methodist so burial in a non-sectarian cemetery like the Necropolis was logical. So was Joshua a “Wilson” or some variation of “Wisbenon”? Had the census taker transmogrified the name, or was it the cemetery sexton? Joshua lived in Yorkville, just outside the boundaries of Toronto in York Township, so the 1851/52 census returns survive. (Those for Toronto do not.) A quick search on Ancestry.ca located a Joshua WILSON in Yorkville, aged 106, born in the “States” and a Methodist. Clearly the same fellow, and confirmation of the surname Wilson. The 1861 and 1851 census showed Joshua as a widower, living alone in a frame house. Both census returns also identified Joshua as “coloured”. So while we’ve managed to answer some questions about Joshua Wilson, I’m intrigued to know more about the circumstances of this African-American man. Born in about 1746, nearly certainly into slavery, when and how did Joshua come to Canada? Was it as another man’s property, or as a Loyalist, or as a later refugee? He would have been an elderly man by the time the Underground Railroad was in full swing. In the months before his death, was he aware of the developing conflict that would lead to the US Civil War and the abolition of slavery? Looking at Joshua Wilson’s life has also pointed out just how important the records of the Toronto Trust Cemeteries are, and why it will be so beneficial to have an index and the digital images available free online. We’d love your help indexing these records. It can be done from the comfort of your home. All you need is a computer with a high-speed connection, and a little knowledge of Toronto communities. To find out more about the project, explore the pages of this web site. To sign up, please e-mail us at info@torontofamilyhistory.org. You can also hear more about the Toronto Trust Cemeteries project at OGS Conference 2010. The “New Toronto Research Tools” session, on Saturday afternoon, will highlight four new online Toronto Branch projects, one of which is the Toronto Trust Cemeteries project, and another is Pat Jeff’s 1861 Census project mentioned above. As we sit comfortably in front of our home computers indexing the burial registers of the Toronto Necropolis, I thought you might like to see what the actual cemetery looked like on a rainy February 27, 2010. The photos also help to explain the reason for all the complicated burial location descriptions like “gore next to”. In the first two months of 2010, we have indexed well over 10,000 names. But there are many, many more to go! If you’d like to help, we’d be very glad of your assistance. Please see the Toronto Trust Indexing page to find out how to sign up.